Born in South Carolina in 1823, Ben Barton was a descendant of a prominent Colonial family. At age nineteen he left the family estate to study medicine at Transylvania College Medical School in Lexington, Kentucky. Upon graduation, he practiced first in Alabama, and later moved to Texas where he met Eliza Brite. They married in 1851. The couple moved to California in 1854, settling in El Monte, where their sons John Henry and Hiram were born in 1855 and 1856 respectively. In 1857, the Bartons relocated to San Bernardino becoming among the first non-Mormon Anglo settlers of the new city. In November of that same year, following the Mormon recall to Utah, Dr. Barton purchased 640 acres of land from Elders Amasa Lyman and Charles Rich for a paltry $500. This was his first land acquisition in what would become the City of Redlands and included the current site of his home, the “Asistencia” or Estancia as it was known at that time, and a portion of the Mill Creek Zanja. He later added over twenty-five hundred acres more to this land and probably continued to purchase land. In the years following this initial land purchase, at the Ranch site, Barton and his family moved back and forth between their San Bernardino home and the Estancia. They first lived in the Estancia in 1859. At that time, Barton planted 60,000 grape vines, using cuttings he received from the San Gabriel Mission. This became the beginning of the famous Barton vineyard and winery. Barton’s contributions toward the areas viticulture industry was his most noted ranching accomplishment. The Barton’s daughter, Mary, was born at the Estancia in 1860. Through the years Barton farmed the land, growing grain, corn, fruit and nut trees and also raised sheep. Finally, deciding to retire from his medical practice in San Bernardino, Ben Barton started the Barton Villa in earnest in 1866-1867 as a simple two-story, “L”-shaped building with a hipped roof. 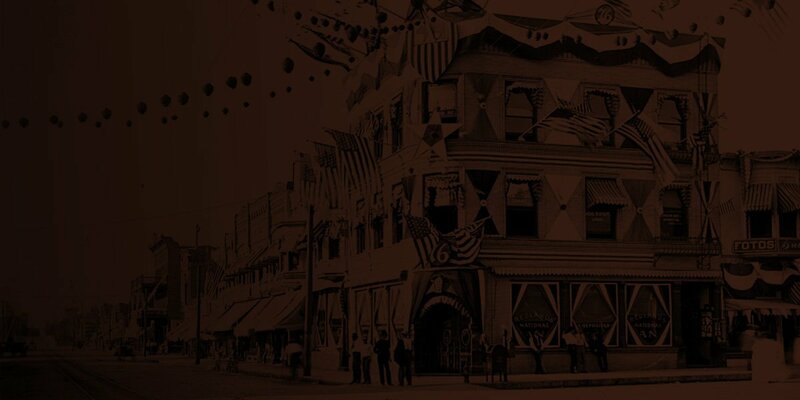 It was the first fired brick building in what is now the City of Redlands and the second in the County of San Bernardino. The clay, for the bricks, was dug and fired in kilns on site. It had an integral two-story, double porch within the “L” of the north facade with square Doric columns, “x” shaped wood railing, and was covered by the hipped roof. Two chimneys were located above the roofline. The separate kitchen building is said to have been used as a jail because of the window bars. While the home was being constructed the family again resided in the Estancia. Circa 1971-1972 the first major remodeling occurred when the Villa was converted into a Greek Revival style building. The roof was transformed into a cross-gable. The west wing was extended and windows were added, flanking the central door at both the first and second stories, plus a shed roof was introduced over the second story porch. Shutters were added to windows at the first story. Orange groves were planted by 1874. By 1880, Frank E. Brown and E.G. Judson, set their sights on creating a new community just south of Lugonia. Although a number of small landowners sold to Judson and Brown, the majority of their land came from three sources: the government, the Southern Pacific Company, and Ben Barton. In numerous transactions in the years 1881-1882, Barton sold them approximately 640 acres of land. Barton also played a role in the development of Redlands’ water supply, when in 1881 he suggested to Frank Brown the possibility of damning waters in Bear Valley. Through Barton’s son Hiram, a friend of Brown’s, it was communicated that forty acres of level land was available in Bear Valley and Brown found this to be a perfect reservoir site. Thus the Bear Valley Land and Water Company was formed and the dam constructed. The Riverside Press and Horticulturist cites the third rehabilitation of the Barton Villa, in 1883, as one which was often associated with domestic modernizations of the time, the Second Empire style. The Villa is the only remaining Second Empire residence in Redlands. The gable roof was converted into a polychromatic wood-shingled Mansard with cresting, and pedimented dormer windows were added. A Mansard cupola, also with cresting, was introduced at the intersection of the “L”. Windows were altered into a 2/2 configuration. The porch was significantly modified: the upper story roof was removed, the porch was extended by wrapping around the west façade, pilasters were replaced with arcaded turned columns at the first story, and a turned balustrade replaced the “x” shaped railing. The wood details were repainted in a polychromatic palette. The Bartons remained at the Villa until 1887 when Ben moved, with his wife and daughter Mary, back to San Bernardino. Ben Barton died on New Year’s Eve, in San Bernardino, in 1898. In 1944 the house passed out of the Barton families hands when it was sold to Henry Strysmas for a reported $14,000. Many subsequent remodels and additions, especially to outlying buildings, have taken place through the years. Significant changes occurred in the 1930s when the cupola, wrap-around porch, and pedimented portico were removed and the polychromatic exterior wood trim was repainted white. Then in the 1950s the “L”-shaped horse barn was constructed at the southern property line, adjacent to the “Asistencia”. However, the essential “bones” of the structure have remained intact. Such beautiful original details as the arched radiating brick lentils above the first floor windows and the flat lentils above the second floor windows still remain. 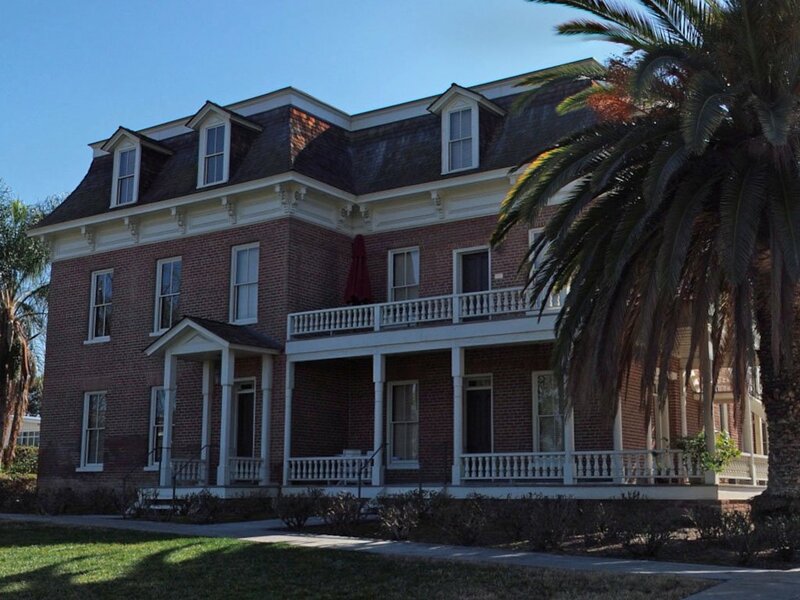 The significance of the Barton Villa has been recognized by the City of Redlands with its listing on the City’s Register of Historic Resources in 1993. Then in 1996 it received designation on the National Register of Historic Places when it was extensively researched by Janet Hanson during the proposal process. Much of this history was drawn directly from Ms. Hanson’s work. In 2003 the current owners, Terry and Geneil Vines, purchased the deteriorating structure from the City of Redlands and set-out to save this proud old brick building. After extensive renovations the Barton Villa once again stands proudly against the sky. Terry estimates that the structure is composed of almost 120,000 original oversized kiln dried bricks. He found that the foundation sits 38 inches below ground and is five bricks thick. The first floor, approximately 47 layers high, is four bricks thick while the second floor (another 47 layers) is three bricks thick. The porch has been returned to its former glory using old photographs. Today, it is difficult to know what is original and what is new because of the attention to detail. A good example are the boxed cornice brackets under the roof overhang which have all been redone and painstakingly reproduced where needed. The Redlands Area Historical Society is proud to present this 2006 Heritage Award to Terry and Geneil Vines for their vision and foresight in preserving this beautiful structure. Their adaptive reuse of the Barton Villa as an office complex has made it possible for future generations to enjoy the historical significance of this vital piece of our local history.